The current assumption is that in 2050. The line graph illustrates the percentage of people aged 65 and older from 1940 out to 2040 in three different countries. Overall, the proportion of the population aged 65 and older all three countries increased over the period of 100 years. It can be seen that Japan had a dramatic growth in the elderly population. It can be seen from the graph, between 1940 and early 2000, there was a gradual increase in the percentage of population aged 65 and over in the USA from below 10% to nearly 15%. With the similar trend, the proportion of elderly people in Sweden grew slowly from about 7% to approximately 13%. By contrast, that for Japan declined slightly and remained below 5% throughout this period. In the remainder of the period, the proportion of elderly population in Sweden increased rapidly to above 25% in 2040. In the other hand, the figure for the USA remained unchanged below 5% until 2020, but it climbed sharply to reach about 23% in the last year of the graph. After the period with a slight increase, the percentage of people aged 65 and older in Japan grew dramatically to its highest point of approximately 27%. Overall, the proportion of the population aged 65 and older in all three countries increased over the period of 100 years. It can also be seen that Japan had a dramatic growth in the elderly population. It can be seen from According to the graph, between 1940 and early 2000, there was a gradual increase in the percentage of population aged 65 and over in the USA, from just below 10% to nearly 15%. With the a similar trend, the proportion of elderly people in Sweden grew slowly from about 7% to approximately 13%. By contrast, that for Japan declined slightly and remained below 5% throughout this period. In the remainder of the period, Subsequently, the proportion of elderly population in Sweden increased rapidly and peaked at 20% around 2012. It is forecast to continue rising to above 25% in 2040. In On the other hand, the figure for the USA remained unchanged below 5% and is expected to stay at that level until 2020, but it is the set to climb climbed sharply to reach about 23% in the last year of the graph. Finally, after the a period with a slight increase, the percentage of people aged 65 and older in Japan grew is anticipated to jump dramatically in 2030 to eventually reach its highest point of approximately 27% ten years later. These days, 65 is not considered to be elderly. I would not use the word "elderly." Lê Anh Dũng Overall, the proportion of the population aged 65 and older all three countries increased over the period of 100 years. Do not use past tense for a time period that is in the future. You must mention in your essay that values beyond the present are estimated, projected, forecast or computed by a demographic model. Values in the past are from actual demographic data. Avoid using the word "figure" in Task 1 to mean a value or number. "Figure" in a technical writing context refers to a diagram or table. "Figure" is mostly used in a financial (business) reporting context, and in the plural form. e.g. Sales figures for this quarter were 10% higher than last quarter. Lê Anh Dũng The current assumption is that in 2050. I think OP means that we should assume we are in 2050 now, so looking at the graph from a future-to-past point of view, hence using the past tense. Shouldn't the article be omitted, teechr? AlpheccaStars Avoid using the word "figure" in Task 1 to mean a value or number. What else would you suggest instead? I just wrote a report for the given graph using past tense, as I assume was desired by the OP. I would appreciate it if you could check it. 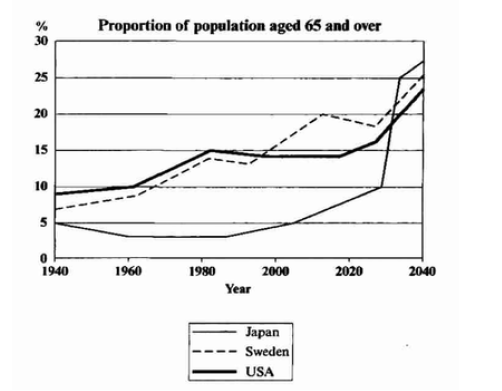 The presented diagram delineates how the population of people aged 65 and above changed over a period of one century in three separate nations: The USA, Sweden, and Japan. Overall, while all the nations at issue generally followed an upward trend over the survey, the figures for USA and Sweden were very close to each other compared to that of Japan. In 1940, 5% of people in Japan were 65 and older. This percentage did not rise until 2005, when it started to go up sharply, experiencing a twofold increase by the end of the 2020's. In 2030, it surged dramatically exceeding 25% in less than 10 years, followed by a less significant growth to the end of the period. Another look at the graph reveals that both the United States and Sweden started the period (in 1940) with figures below 10%. By the same token, they achieved a steady growth, reaching 15% in 1990. While the percentage of the senior citizens in the United States of America plateaued out remaining at the same level until 2015, that of Sweden outstripped it, accounting for one fifth of the total population in 2010, though it subsequently suffered a minor setback for the next 15 years. Finally, both the proportion of the age-group at question in these nations climbed swiftly to around 25% at the end of the survey in 2040. Persian Learner I think OP means that we should assume we are in 2050 now, so looking at the graph from a future-to-past point of view, hence using the past tense. Assume that we are in the year 2050, looking back at the population changes over the previous century. The instructions for these essays are usually written in grammatical English. I have never seen instructions that specify that we are writing from the point of view of a past or future date. AlpheccaStars I have never seen instructions that specify that we are writing from the point of view of a past or future date. Neither have I, but I suppose the OP wanted to practice past tense in such a graph. It's not uncommon for some teachers to have their students write several versions of the same task, just for the sake of practicing tense. In that case, students can can place all their focus on tense and point of view instead of on planning the the essay each time.